Come meet William and Rosie at PETsMART in Aliso Viejo located at 27961 Aliso Creek Road. On Saturday they will be out in front of PETsMART from 10:00am - 4pm. Stop by and say "hello"! "William" 2 year old Boxer -- he is very handsome! William is very sweet and is very good on the leash. He would love for you to take him for a walk! 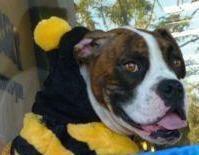 Isn't he cute in his "bee" costume? 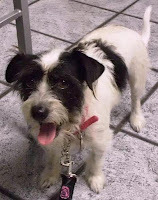 "Rosie" 3 year old Parson Russell Terrier / Cairn Terrier mix with a very sweet temperament--she is very affectionate. Rosie is great with other dogs and would make a wonderful companion for you and your dog!